The EB-5 Immigrant Investor Program (the "EB-5 Program") has become one of the most popular forms of alternative financing. Under the EB-5 Program, each investor invests $500,000 (in rural areas or areas with higher than average unemployment) or one million dollars (everywhere else) into a project. The principal criteria are that the investor's capital infusion must create at least 10 jobs for U.S. workers, and maintain those jobs for two years or more. If these criteria are met, the investor and his or her immediate family receive permanent residence (a green card), allowing them to live in the United States (and incorporating their worldwide income into the U.S. tax system). Direct (or individual) projects, in which the investment must create at least 10 jobs itself, and regional center-based projects, in which several investors combine their investments into much larger projects with significant direct and indirect job-creation benefits. The required investment level is one million dollars unless the investment is made into a business located in a "targeted employment area" (unemployment rate that is 150 percent or more of national coverage), a rural region (population less than 20,000) or a "troubled business enterprise" (at least 20 percent decline in value over the past 12 to 24 months), at which time a reduced investment of $500,000 is required. 1. The amount of money being invested by the developer/sponsor in the project or the applicable business, with typically a minimum equity investment of 25 percent of the total project cost. 2. The quality of the sponsor group and its prior track record in similar types of operations. 3. The quality of the business itself and whether it includes identifiable brand names or special situations, such as nationally branded hotel chains, restaurant or retail operators. 4. The safety of the job creation of the 10 jobs per investor. Investing in a regional center additionally provides flexibility through the acceptance of indirect job creation as part of the job requirements. As of February 1, 2013, there are 251 approved regional centers, operating in 45 states, including the District of Columbia and Guam. Approximately 92 percent of the individual Form I-526 petitions filed each year are filed by foreign investors who are investing in regional center-affiliated commercial enterprises. 1. 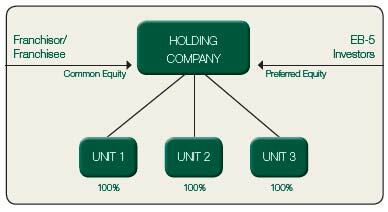 Formation of holding company that would have subsidiary entities that would own the retail facilities. 2. The EB-5 investors would invest preferred equity in the holding company and receive a fixed-dividend return. The franchisor or franchisee would also invest in the holding company and own the common-equity interests. 3. Since the holding company will own a 100 percent interest in all of the subsidiary entities, under USCIS guidelines, all jobs created by the subsidiary entities would otherwise count toward the 10-job requirement for each investor. The subsidiary entities could also not only include the operating entities, but separate entities that may own real estate interests as well. 4. When the investors finally receive their I-829 approval after the minimum time period for investment of two years has been satisfied and proof of job creation has been provided, then the holding company could redeem the investors' interest for the fair-market value, which should be the capital account plus any accrued preferred returns. 1. Ease of execution since there is no need to go through a regional center. 2. No need for an economic study since the reliance is totally on direct job creation and, therefore, the holding company/ employment company would just need to provide W-2 employee information. When the necessary two-year investment condition has been met and the proof of employment has been provided, an I-829 petition is filed that will enable the lifting of the temporary green card restrictions and cause the green card to become permanent in nature. The regional center or direct investment program offers a unique opportunity to enable the franchise system to raise debt or equity capital at very reasonable rates to enable the development of additional corporate or franchise units.